How can a city defy climate change? That is the central issue which the project "Town and Country in the Flow - Network for the Creation of a sustainable Climate Landscape (KlimNet)" wants to work out. In this project, a close cooperation between different players is used to collect ideas on how to deal with a noticeably changing climate. The ideas shall come both from citizens, universities, municipalities, companies and other interested parties on a local level. Everyone is faced with the effects of climate change; hot spells and droughts, heavy precipitation and the increase of pollen are only some examples. The participation of scientists, municipalities and members of the public will bundle a lot of information and knowledge so that new approaches can be developed. Everyone who is interested in taking an active part in the project is welcome and can join or leave at any time. The goal is to develop new ideas, to advance already existing local initiatives and to spread all of them. Therefore, formats like crowd-mapping, seminars, excursions and local information-points are used. Permanent project partners are the WILA Bonn, the Departments of Geography of the Universities of Bonn and Bochum and the Cities of Bonn and Gelsenkirchen which serve as model towns. The project is funded by the Federal Ministry for the Environment, Nature Conservation, Building and Nuclear Safety (BMUB) following a decision of the German Bundestag (funding code 03DAS098B). Detailed information and a German project description can be found on the WILA website. For more information, please also see the English research summary on the webpage of the Department of Geography, University of Bonn. What are climate landscapes? To answer this question and to find the hot spots of landscape development, remote sensing technologies are used. 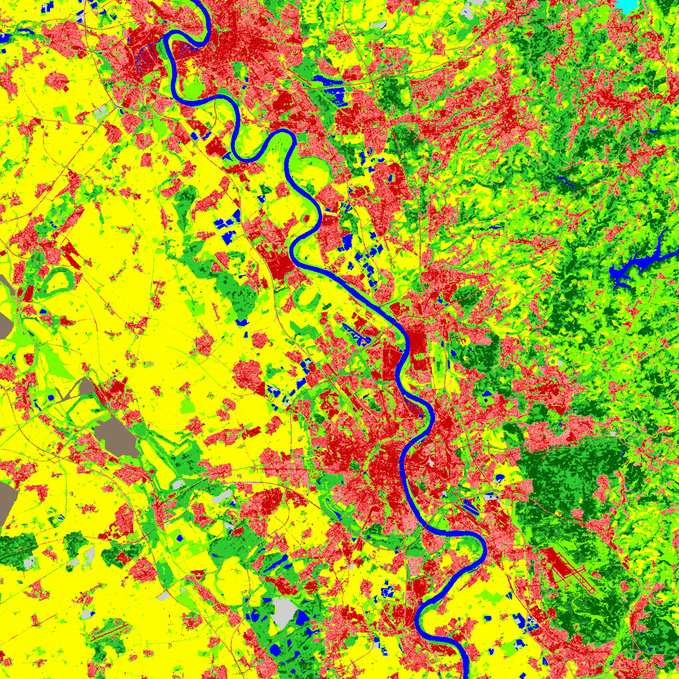 Satellite images from the last 40 years show the change of forests, rivers, cities and settlements. Cities are expanding their sealed surfaces, rivers and other streams lose their inundation areas and agricultural areas turn into new housing estates. This makes towns more vulnerable to climate change. After creating a database, the value, mutual reactions and interplay of the planned actions have to be evaluated as well as their transferability to other cities. During the project duration of three years, it is not possible to implement all planned measures. Nevertheless, another aim is to develop an action guideline, which will outlast the project and may be useful for other cities as well (see www.klimalandschaften-nrw.de, online from January 2018 onwards).